1.3 MBPD Oil Growth for 2019? Nope. BP CEO Says *1.4* MBPD Growth. Climate-Change Panic-Mongers to Panic More? The virtue-signaling climate-change panic-mongers will probably not like this level-headed observation by BP CEO Bob Dudley. "Not like" being an understatement. The average annual increase in global oil demand is 1.3 Million Barrels Per Day. BP CEO is expecting 1.4 MBPD increase for 2019. 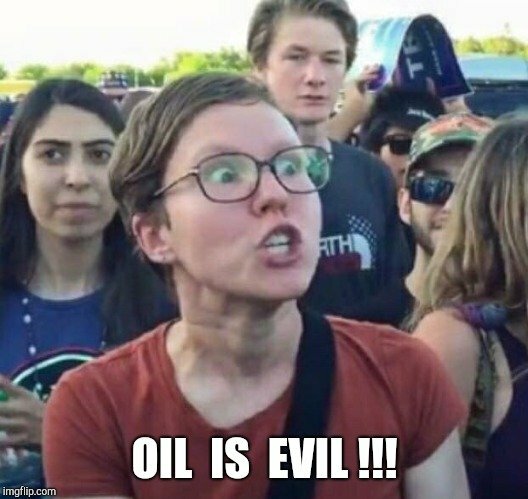 Waiting to see if idiotic Alexandria Ocasio-Cortez will move up her ZOMG THE WORLD WILL END IN 12 YEARS doomsday panic-mongering over this additional increase in global demand for oil. Although I would be amused to see a meltdown by climate-change panic-mongers, that their shrill panic-mongering is simply failing to produce the desired effect of panic, doom, gloom and despair in others, over their much-hyped climate-change bogey-monster-demon. BP forecasts global oil demand will grow by 1.4 million barrels a day in 2019. "We're not actually seeing this worrying thought that it's all going to start falling," Bob Dudley tells CNBC at the World Economic Forum in Davos, Switzerland. Dudley thinks oil prices are "heading back into a reasonable balance" following two "big" overcorrections. I am of course amused by all the artwork, however there is the real world. In the real world, there is a tiny minority of left-wing 'socialists' in Congress. There are a lot more veterans and suburban middle-class insurance sales and real estate agents whose biggest fear is soccer moms. Nobody has any idea how many BPD of oil will be produced this year. Estimates of that sort have been way off for the last decade or so, and are likely to remain questionable for the forseeable future. The remaining question is exactly what does 'produced' mean? If I make oil from CO2 and water it's obviously been 'produced'. That doesn't mean it was pumped out of the ground. The same goes for making hydrocarbons from biomass. If China goes into recession do we still consume an additional 1.4 million BPD? Same goes for a volcanic eruption that curtails airline flights.